They call it "the weed that ate the South." Can you hear it eagerly munching on the hillside here? Once Kudzu takes over, there is little chance for anything else to grow. It's probably the most noxious weed in the southern US, and it seems to be spreading rapidly along the Blue Ridge Parkway as well. Kudzu itself is actually edible. You can eat it steamed, boiled, deep-fried, pickled, or even raw. The root can be dried and powdered for food starch. As a fodder plant it provides excellent nutrition similar to clover and alfalfa. 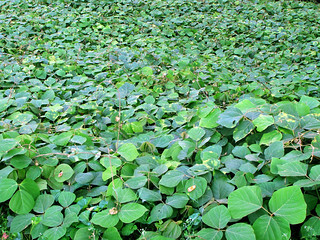 Kudzu also has medicinal uses and longstanding use in traditional Chinese medicine (it is native to China and Japan). It is even investigated for the potential to turn its starchy roots into ethanol for biofuels. The problem is it grows too fast and smothers and out-competes every native plant where it grows. In Georgia the saying goes you must close your windows at night to keep it out of your house. As a legume, it can fix nitrogen so it comes with its own built-in fertilizer system to allow it to grow rapidly even on poor soils, and as an introduced and invasive species it has no natural enemies in the US to keep it in check. Introduced in 1876 at the Centennial Exposition in Philadelphia in the Japanese garden display and subsequently sold all over the US as an ornamental and promoted for erosion control, it has gone out of control in the South where it encountered nearly perfect growth conditions. 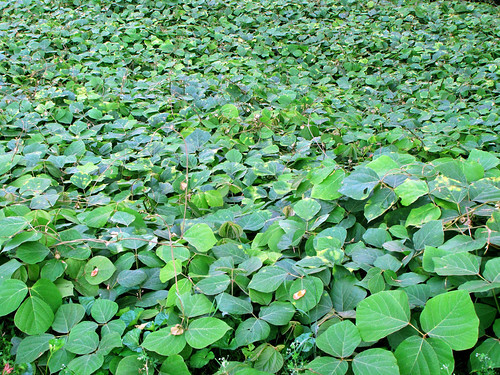 It has been estimated that Kudzu has been spreading at a rate of 150,000 acres per year and costs the US around $500 million annually in lost forests and cropland and control efforts.